With beginnings tracing back to 1997, Kitchener Downtown Community Health Centre evolved from an idea in the minds of a group of Kitchener’s downtown residents into a thriving hub providing primary health care, health promotion and community capacity development. Centre relies on a combination of creative thinking and intentional partnerships to ensure responsiveness to the downtown community. 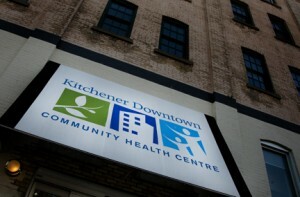 KDCHC recently moved to a new location in Kitchener’s downtown core, close to its clients and partners. Goals for the future include increasing primary care service capacity, partnering for a broader range of services, and increasing responsiveness to client needs.